This section of the handbook has focused on providing general guidelines for setting up and planning an evaluation exercise for a PPD. Some methods and tools for data collection have been presented. 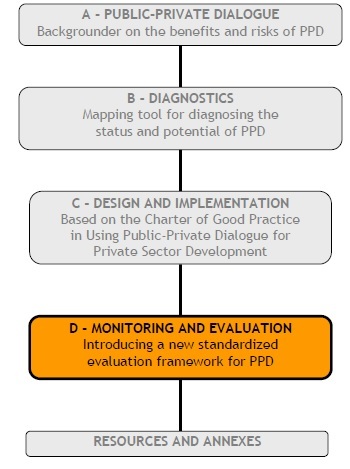 Three frameworks, tools, and sets of indicators have been introduced, with the purpose of enabling comparison and benchmarking of outcomes and impacts of PPDs. These inputs, of course, are additional to ongoing M&E efforts within the context of PPDs or even broader programs of governments, development partners, and NGOs. Our suggestions are not meant to replace these ongoing efforts but to complement them. Where possible, frameworks, tools, and indicators should be linked to existing ones and not treated as a stand-alone evaluation exercise. Cross-checking of outcomes of different frameworks and tools will greatly improve the quality of impact analysis. Additionally multi-stakeholder meetings, such as focus groups, are useful techniques for validation and discussion of findings in a participatory way with all the stakeholders involved in a PPD. The data collection tools and frameworks with indicators can relatively quickly and simply generate analysis of data and present them visually to stakeholders in the evaluation exercise for further discussion and analysis. The information generated by the frameworks can be compared over time – for example, periods of half a year or a year – in order to assess how a PPD is developing. 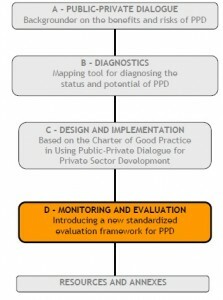 comparative analysis and benchmarking of outcomes and impacts of PPDs in different settings. Many of the tools and frameworks are still works in progress, and new insights will further improve their relevance and usefulness. Of course these tools and frameworks are not blueprints; they need to be tailored to each context. Finally, frameworks and tools do not directly solve the difficult issue of attribution in evaluation exercises; this will always require thorough analysis and thinking. The inputs in this chapter are intended to help in this process. make them more accurate over time, and more comparative across different contexts. The material in this work is copyrighted. Copying and/or transmitting portions or all of this work without permission may be a violation of applicable law. The sponsors of the work encourage dissemination of its work and will normally grant permission promptly. For permission to photocopy or reprint any part of this work, please send a request with complete information to the Copyright Clearance Center, Inc., 222 Rosewood Drive, Danvers, MA 01923, USA, telephone 978-750-8400, fax 978-750-4470, www.copyright.com. All other queries on rights and licenses, including subsidiary rights, should be addressed to the World Bank, DFID or the OECD Development Center.